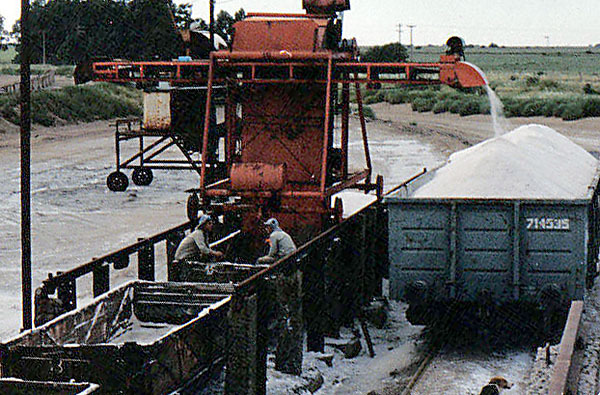 Additional pictures showing the surviving remnants of Señor José Gerschman's salt railway at work around 1990. 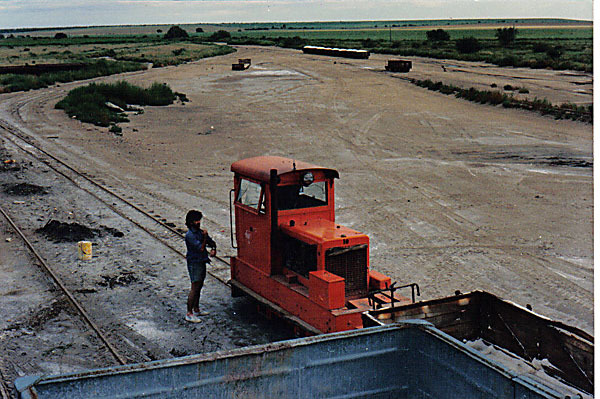 A small four-wheeled diesel loco, almost certainly a Brookville, waits out on the pampas with a loaded train of salt wagons. 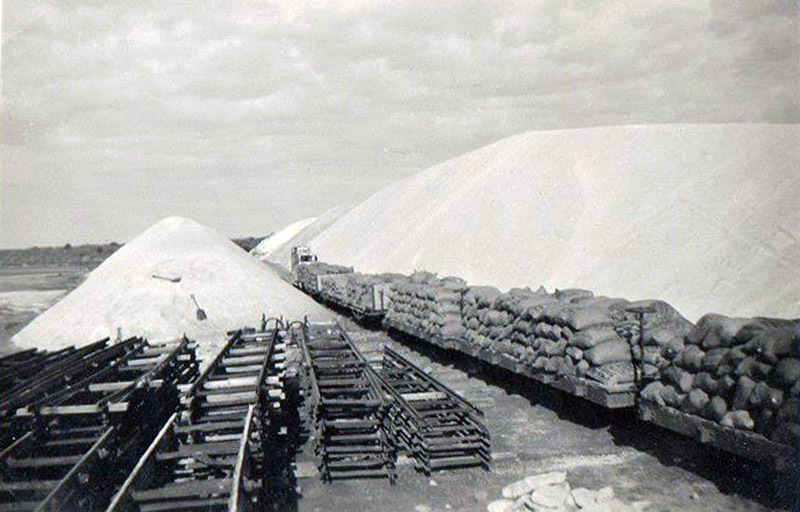 A broad gauge wagon here receives salt from a lorry as well as from the narrow gauge wagons in the foreground. A view from the lorry discharge ramp shown above. 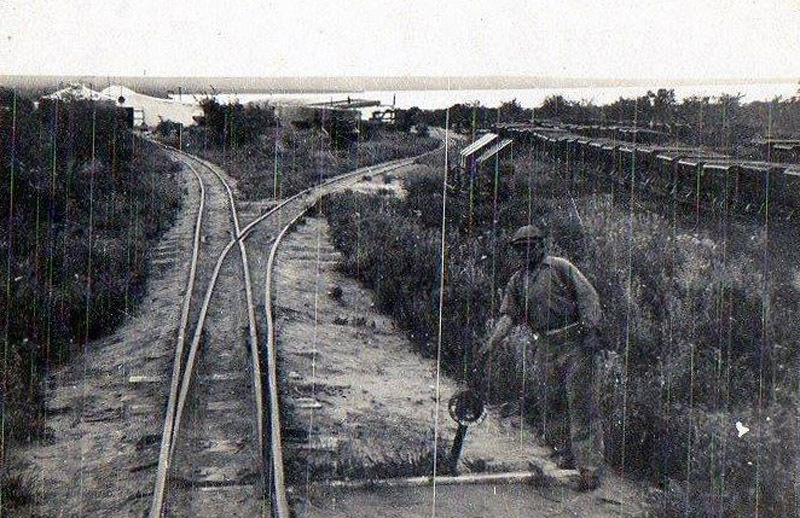 A loaded train approaches the main road crossing seen in the photo on the main salt railways page. 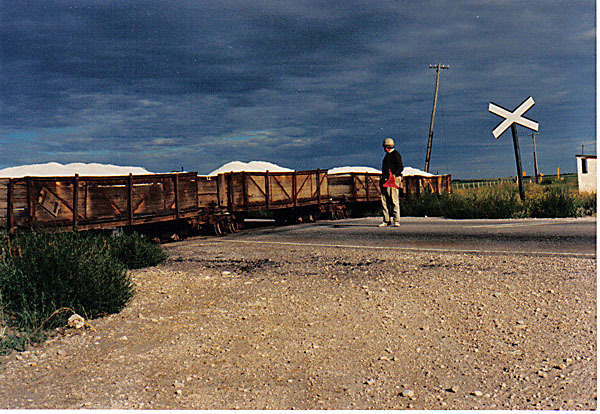 The bogie wagons cross the main road. 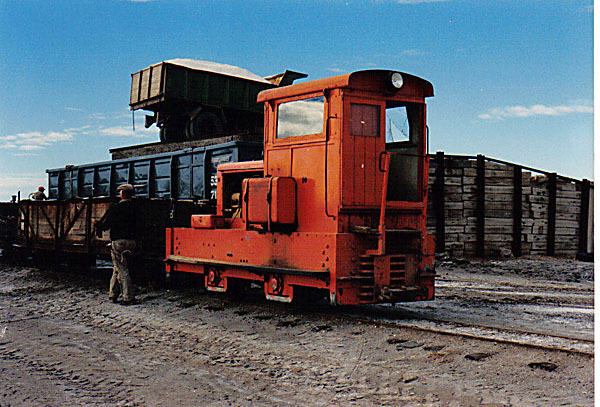 Given that the original rolling stock of this railways was sourced from the FCS agricultural narrow gauge system, which turn was set up with ex British War Depertment equipment from the WW1 trench railways, it is not really surprising that the wagons bear more than a passing resemblance to WD D-type wagons. 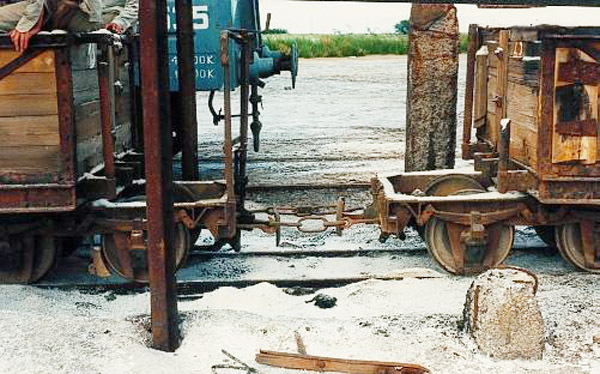 The transfer of salt from narrow gauge to broad is accomplished by means of this elevator/conveyor. 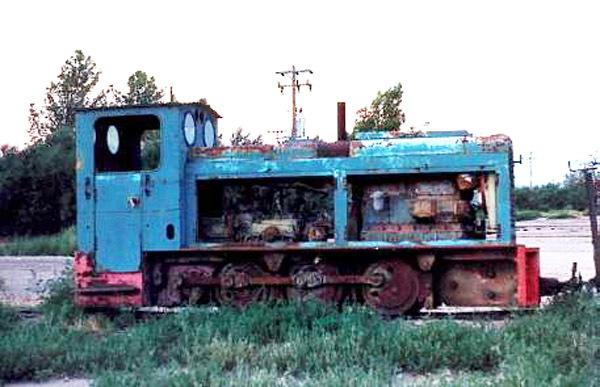 This Ruhrthaler 0-6-0 diesel was lying derelict along with a passenger coach. A side view of the Ruhrthaler. 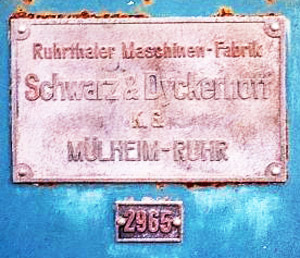 The worksplate and builder's number - 2965. 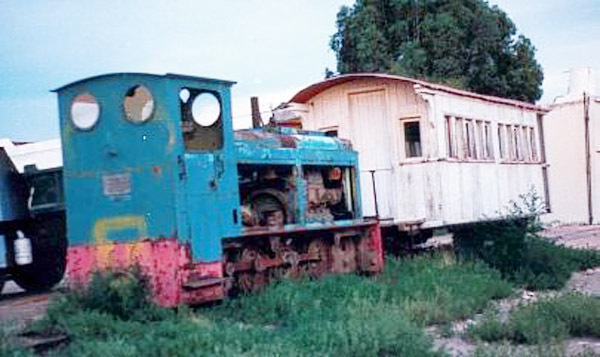 The wagons are apparently of German army feldbahn origin, dating from the First World War, and may have come via the FC Sud field railways (1). 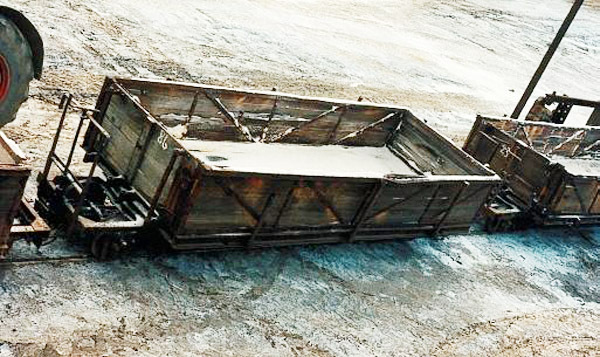 A view of one of the German wagons from above. 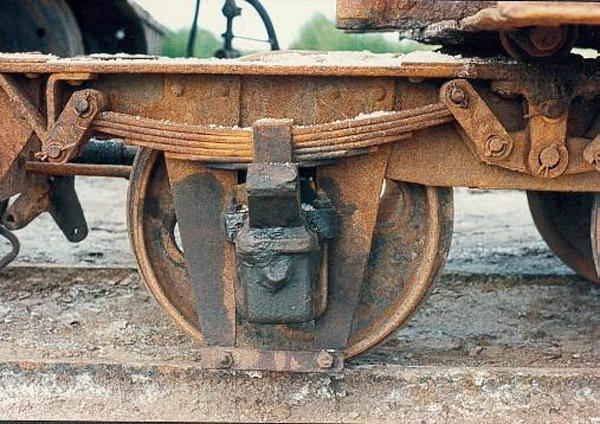 The suspension and axlebox of a bogie on one of the German wagons. 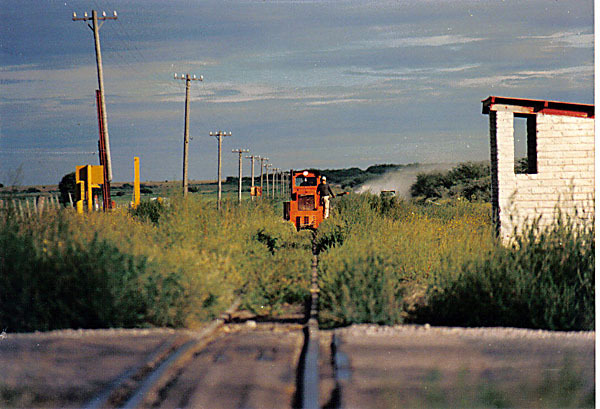 The following three photos have been supplied by Señor Héctor Guerreiro, by whom they were taken in 1985. 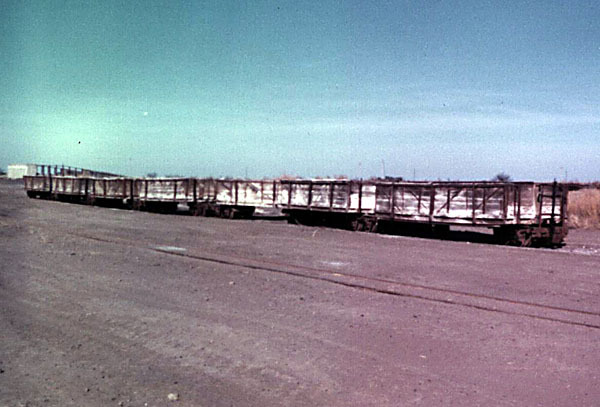 Bogie salt wagons and four-wheeled skips. 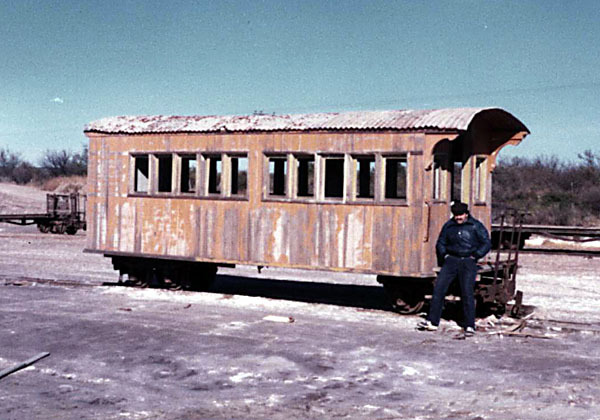 The passenger coach shown here is of a surprisingly professional design. It must be wondered whether it, or parts of it, came from some public railway somewhere. 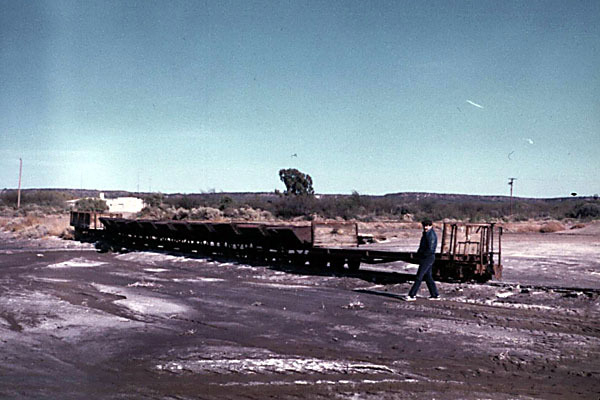 1 The 1990 photos of the Salina Las Barrancas were provided through the kindness of Señor Ruben Marcelo Rabina, the administrator of the 'Trocha Angosta - Modelos y Prototipos' e-group. It is he who has stated that the wagons are of German army First World War origin. 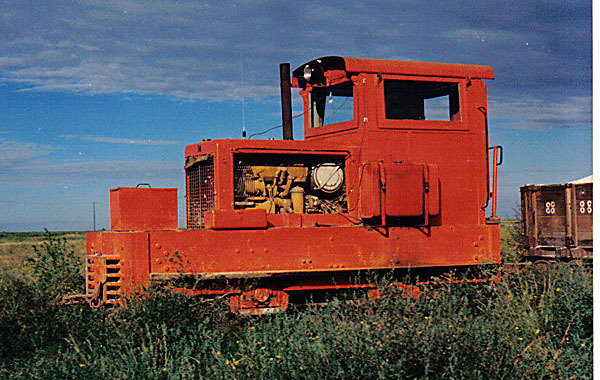 2 The 1985 pictures were forwarded by Señor Hector Guerreiro. 3 Found in Facebook, Carmelo Haag (24/9/16, no longer available).